Precies weten waar het naartoe gaat. Zo geven wij vorm aan een stabiele toekomst. Public spirit and social commitment cannot be taken for granted. Which is why it’s extremely pleasing that there are a number of companies in Wiesbaden strengthening social cohesion in the city with their voluntary activities. Naturally, the regional capital is doing its bit too, by raising awareness and promoting sensitivity for social responsibility among companies based in Wiesbaden with “The Golden Lily” award initiated by the Social Services Department in cooperation with UPJ e.V. Auktion & Markt AG has been increasingly involved in a whole variety of projects and activities for many years – whether it’s as part of “Wiesbaden Engagiert”, the Wiesbadener Tafel, Speisekammer Biebrich, J. P. Morgan run or other donations in cash and kind. The Golden Lily jury was of the opinion that our social commitment deserved special recognition. This was followed promptly by an invitation to the official award ceremony on the evening of 19 September, 2016. Günter Kaufmann, Member of the Board, was honoured to accept “The Golden Lily” from Mayor Arno Goßmann at the Wiesbaden Chamber of Industry and Commerce’s elegant building for the first time. This is a special award for our company but it would not have been possible without the wide-ranging involvement of several employees. Which is why we extend our sincere thanks to everyone who regularly contributes and actively does their bit for social cohesion in Wiesbaden. 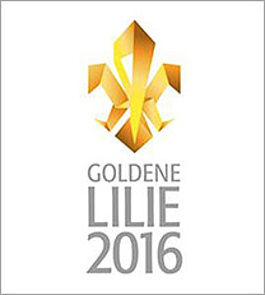 Particularly committed companies from Wiesbaden and the surrounding area have been awarded and publicly honoured with the Golden Lily since 2010. Any company, whether it’s from retail, skilled trades, industry or the service sector, can compete for this special award with its social commitment.